In recent years the G.I. 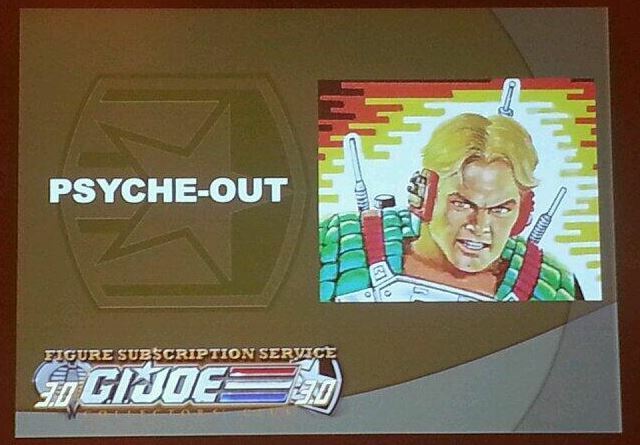 Joe Collector’s Club roundtable panel has become one of the most anticipated G.I. Joe Convention events. 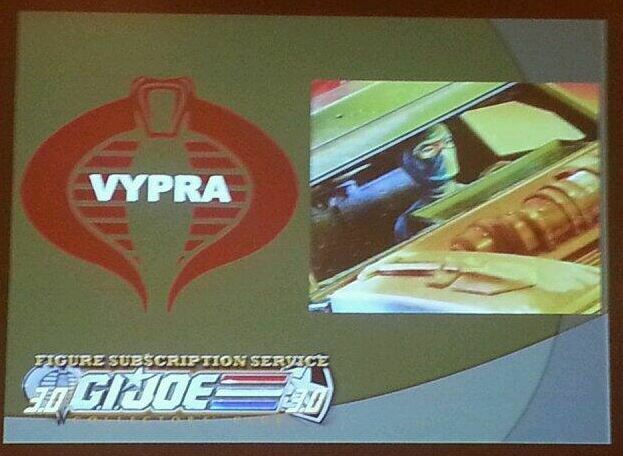 The reason for this has been the announcement of the year’s forthcoming Figure Subscription Service line-up. At a time when the G.I. Joe brand is essentially absent from retail shelves, this “members only” service is the only avenue for many collectors to acquire new G.I. Joe figures. This year JBL was unable to attend the G.I. Joe Convention in Dallas but fortunately good friend of the site Justin Bell of GeneralsJoes.com was on hand and live-tweeted the entire panel. I’m mirroring his images below with some thoughts on each character in the announced line-up. It’s a decent line-up that filled with characters that are sure to get fans excited. Granted, one quarter of the series will consist of repaints from the Nocturnal Fire 2013 convention set but that set had some of the best convention figures produced yet. Plus, given the oft-repeated mantra of how expensive everything is for the GIJCC, this level of cost-saving makes some logical sense. So, let’s break down the figures and some possible construction options. 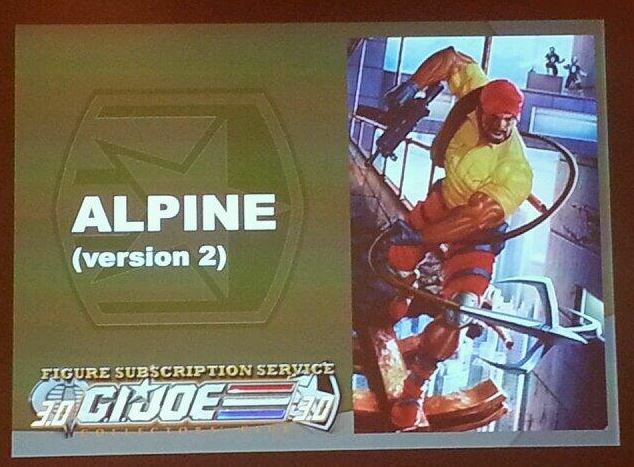 Dipping back into the well of Valor vs. Venom, Alpine v2 will be seeing new life in the FSS. Construction for this one is a no-brainer; given the shorts and short sleeves this will most likely be built on a G.I. Joe Retaliation Kwinn body with the hard-to-find 25th Anniversary Alpine head plopped on top. It’s a relatively easy parts combination that requires next to no new tooling– although I’m surprised the Club went with the v2 “McDonald’s color scheme” as opposed to the Tiger Force Alpine that followed a few waves later. 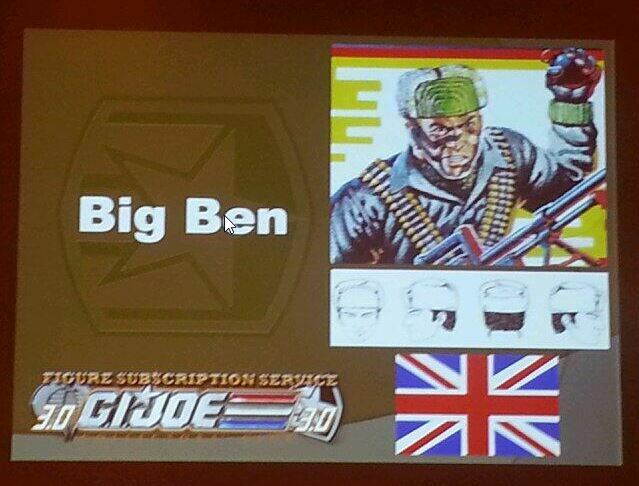 Big Ben is one of those Joes that came after “my era” of G.I. Joe. He’s one of the cast who was featured more in the DiC episodes and so slipped complete beyond my notice. However, he’s got a basic enough uniform that the club should be able to replicate his body design with ease, possibly topping it off with the 25th Anniversary Rock-n-Roll ammunition belts. 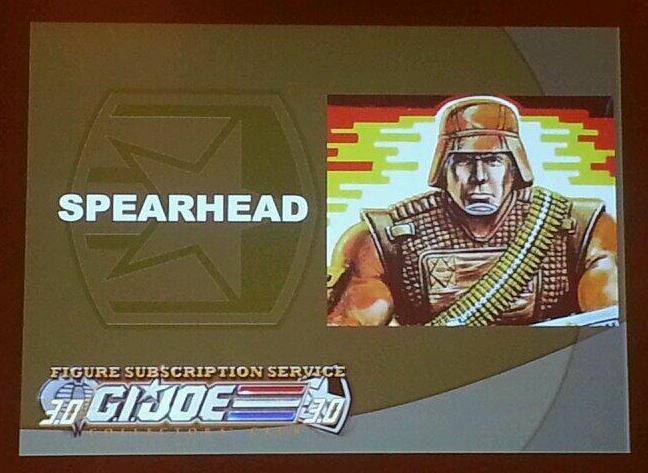 It was confirmed at the panel that he will be getting a new head sculpt as seen in the sketches in the slide. I’ve made no secret of my love for the new character that were introduced in the G.I. Joe vs. Cobra era and Bombstrike is no exception! Part of the “Stahl Family” storyline, she’s a welcome addition to my Joe collection! For constructions I’d be surprised if the lower body wasn’t based on the Rise of Cobra Cover Girl. The upper torso will either have to be be newly-tooled or the design altered as no female t-shirt torso exists. I could, however, see the GIJCC using the Renegades Scarlett body as well. A SOLID addition to the line-up! Okay, this is one that I didn’t see coming in any way but that’s not a bad thing! 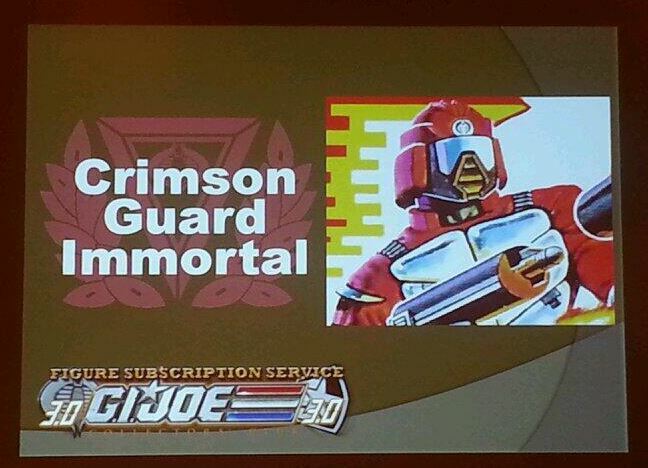 For this, I’d almost expect the Club to utilize the base body of the recent Retaliation Crimson Guard. For the padded chest armor, it all depends on how closely the Club wants to adhere to the original design as a myriad of body armor choices exist. While I have never had particularly strong feelings about the Crimson Guard Immortal this is an interesting entry in the line-up! Justin would kill me for saying this but I’ve never been a huge fan of Hit & Run. I don’t dislike him but I’ve never really had any strong attachment to him. However, a lot of fans do and last year’s Nocturnal Fire version seems to have fallen short with many of them. 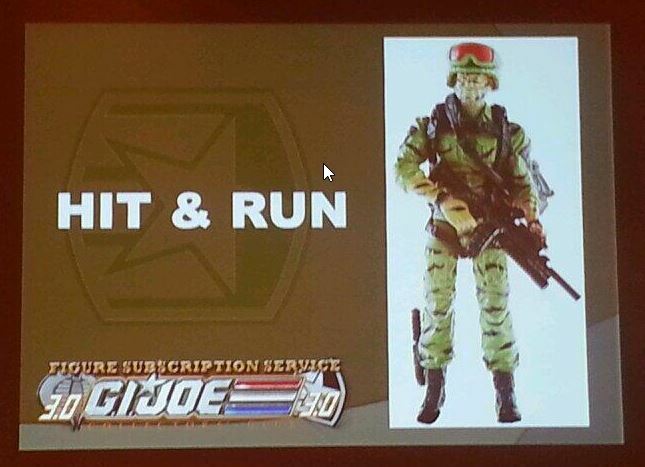 So, at risk of duplicating the 2009 25th Anniversary Hit & Run the GIJCC is diving in with another attempt replicate the v1 design– this time based on the Concept Case version that was shown at Joe Con a few years ago. I have to admit, if he’s more poseable than the 25th version I’ll be quite pleased– even though it means I’ll now have 3 different generation 3 versions of Hit & Run and still not one functional version of Gung-Ho! YES! I’ve been a fan of the original Muskrat for years now and last year’s Nocturnal Fire version was a fantastic update! For this figure I pretty much a straight repaint of the 2013 Joe Con version but it looks like his boogie board will be added to the figure’s kit. 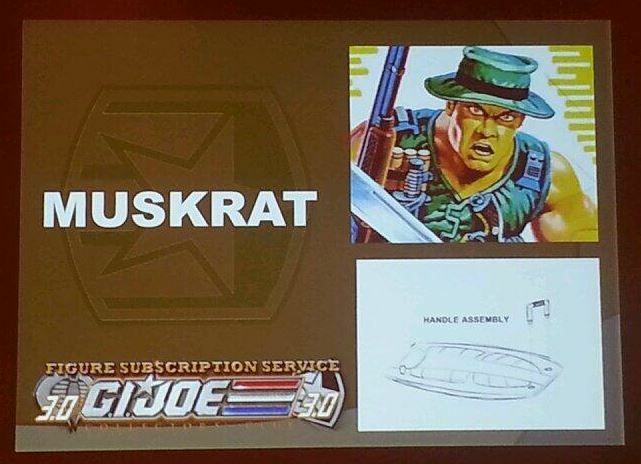 Usually repaints like the FSS Tiger Force Shipwreck do nothing for me but in this case I’m very much looking forward to a more classic color scheme on Muskrat. Last year’s Noctural Fire convention set featured a stellar roster of both characters and figures but in the opinion of this Joe fan Psyche-Out was one of the best of the bunch. The GIJCC managed to recreate a vintage character in a plausibly updated fashion and took a character whose first version could be viewed as “kind of doofy” and made him a star of the set. I expect this figure to be a straight repaint of the 2013 convention version with no real changes to the character’s accessories. For many fans, Repeater was one of the star’s of the 2013 Nocturnal Fire set! The updated convention version of the character was based on the G.I. Joe Retaliation Ultimate Roadblock body and added significant height and girth to the figure when compared to the original 1988 version. As with many of the Nocturnal Fire pieces, I don’t expect the Club to do anything new other than to re-release the Joe Con version with a more vintage color scheme. I reviewed the vintage Spearhead (& Max) figure years ago and was very excited to get an updated Night Force version of him last year as part of the Nocturnal Fire set. In fact, he was one of my favorite pieces in the entire set! As with the other Nocturnal Fire alumni, I expect a straight repaint with no real changes to the figure or the figure’s accessories. Yes, it’s a cost-saving step for the Club but anymore that is to be expected. The original Vypra was a straight repaint of Jinx in darker colors– so I think it’s a safe best to assume that we’ll see the same here. The most logical choice would be to use the body from the SDCC Jinx as it most directly resembles the vintage figure. 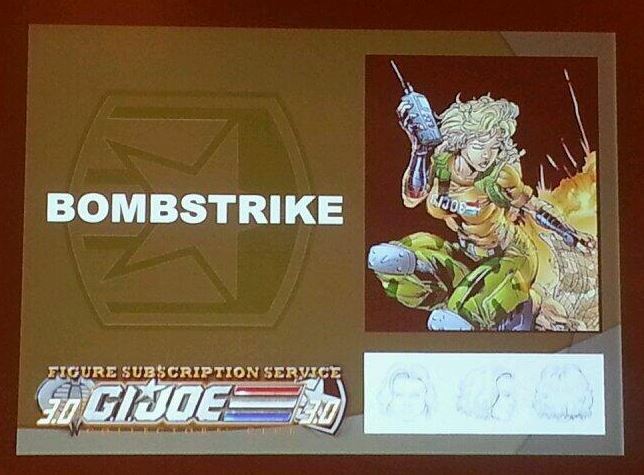 Perhaps we’ll see the kit from the FSS version of Jinx used again here? So there you have it– one fan’s take on both the roster and the parts construction for the forthcoming G.I. Joe Collector’s Club FSS 3.0! As of now I’ve not seen any details on when the sign-up period would begin. 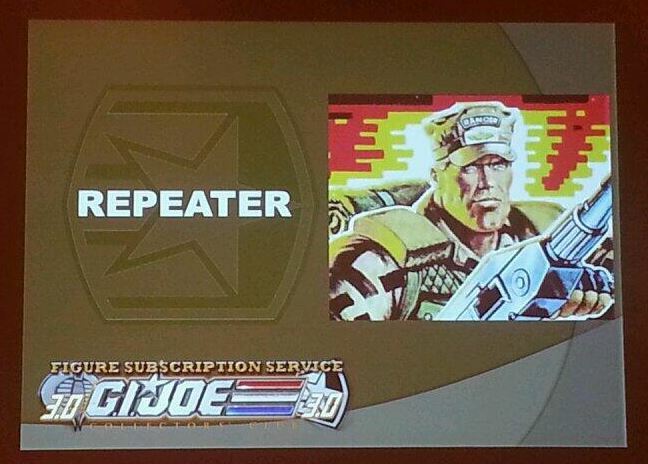 Given the fact that no prototypes (digital or otherwise) were shown it’s probably quite likely that the FSS sign-up won’t be for a few more months with the service to start shipping in late Fall 2014. One thing to note– apparently the Club is aware of some of the dissatisfaction that subscribers had with the “13th Figure” this year. 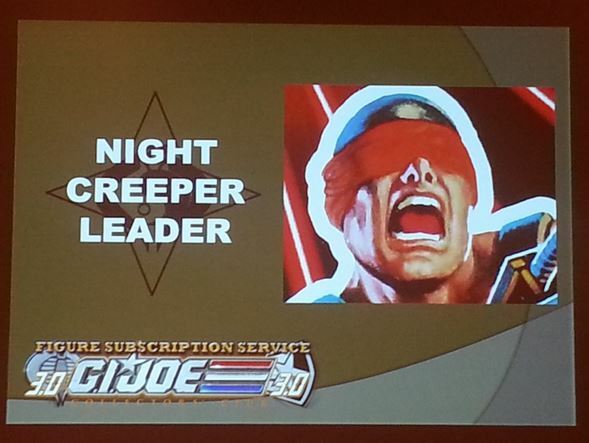 A big thanks to Justin Bell of GeneralsJoes.com for live-tweeting the entire panel yesterday! So, what are your thoughts? Are you in for FSS 3.0? Is this an easy pass? Feel free to leave your comments below or over at the discussion thread in the JBL forums! This entry was posted in Collector's Club, Conventions, News and tagged 1:18 scale, 2013 Joecon, A Real American Hero, Alpine, Big Ben, Bombstrike, Collector's Club, Conventions, Crimson Guard Immortal, Exclusive, Figure Subscription Service, Hit & Run, Muskrat, Night Creeper Leader, Nocturnal Fire, Psyche-Out, Repeater, Spearhead, Toys by Fred Meyer. Bookmark the permalink. 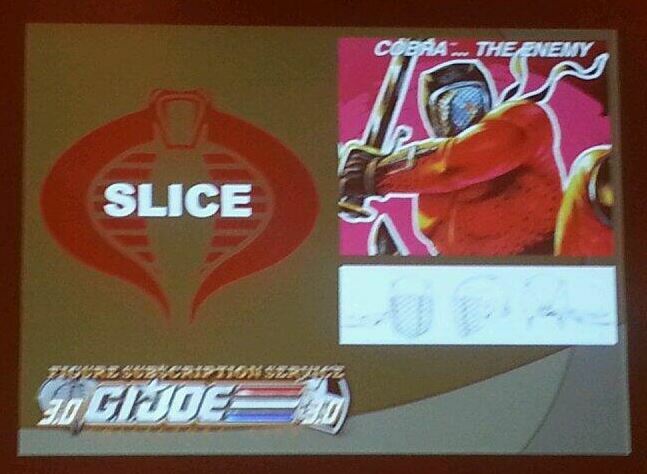 Justin indicated that Slice and Alpine will have new head sculpts. This is a great line-up. I plan to bump my subscription level up from 2 figures each to at least 4. Feels like things are starting to click. Thanks for posting your insights.